Everyone including instructor must remove their shoes upon entering and must be wearing socks. No food or drinks in the play area. All food and drinks must be consumed in the seating area. Parents may not leave the premises without their children. All playing children must have a signed waiver on file. 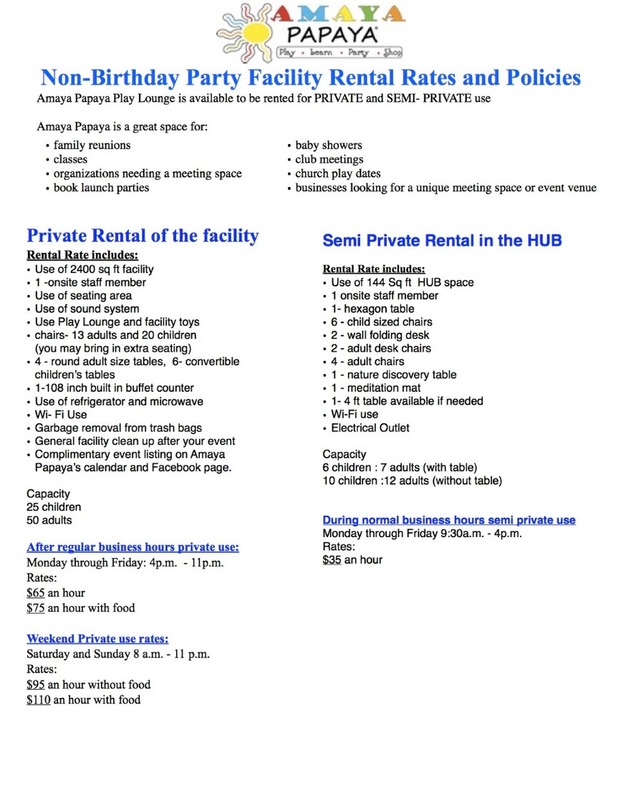 In consideration for the rental of Amaya Papaya any person or group hereby agrees to indemnify and hold harmless Amaya Papaya from any and all actions and suits related to its use of the facility. Further, such person or group agrees to reimburse the Amaya Papaya for any and all costs for repair or any special cleaning that may be required and all damage that may be caused directly or indirectly to the Lounge and/or facilities by such use. Amaya Papaya will not provide electronic or other class support materials such as markers, paper, etc. Meeting organizers are permitted to bring their own equipment, however Amaya Papaya staff will not support its operation. The applicable fee will be assessed for each additional hour or fraction thereof. Refunds will not be issued for classes and or events that end before the scheduled time. Chairs and tables are available, but the group is required to set them up and return them to their original positions when the class is over. Clean up of the Lounge, including throwing away food products, paper items, the wiping down of tables and cleaning the dry erase board if used is the responsibility of the persons using the Lounge. Everyone using the Lounge must follow Amaya Papaya policies. Amaya Papaya staff will not provide assistance with class and/or event set up. Final Payment of the rental is required before the event begins. Fifty percent of the total rental fees and a signed Facility Use Contract will secure an event date. If reservations are made within 2 weeks of the event date, the total rental fees, deposits, and applicable taxes are due in full. The rental fee balance is due 2 weeks prior to the event. Cancellation Policy: Not responsible for cancellation due to inclement weather or conditions out of Amaya Papaya's control. All paid deposits, additional payments towards your balance, are non-refundable. We can reschedule to another available date/time if needed at no additional cost or penalties within 6 months (180 days) of the scheduled date. NO EXCEPTIONS TO ANY OF THE ABOVE POLICIES LISTED.